8K TV – everything you need to know | What Hi-Fi? Yes, 8K video really could be closer than you think. From 8K TVs to 8K broadcasts, there has already been a huge amount of work put in to making the resolution a reality for consumers. 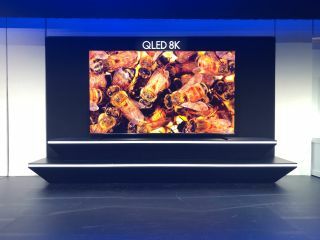 We've already reviewed the first 8K TVs to market in the shape of the Samsung QE85Q900R (85in) and QE65Q900R (65in) QLED models, and as became evident at CES 2019 there are plenty more rival sets coming this year. It's fair to say 4K TV is now mainstream. That doesn't mean we're all watching it, all the time – but if you're sizing up a new TV and you care about picture quality, 4K resolution should be on your wish list. And thanks to the likes of Amazon Prime Video, Netflix, YouTube, 4K Blu-ray, BT and Sky, there is suddenly ample 4K content to watch. The 2018 World Cup in 4K, courtesy of the first full 4K iPlayer live trials, provided further proof of that. But, as ever in consumer electronics, there is always something new on the horizon. The prospect of 8K certainly shouldn't affect your eagerness to go 4K – but to be informed is to be empowered, so we thought we'd round up the state of play for 8K. So, who's working on 8K? And when could we be watching it? What we're talking about here is resolution. This means the number of horizontal and vertical pixels. Pixels equal information, so more pixels should mean a better quality image. That's the theory, at least. In the case of 8K, this means a horizontal resolution of 7680 pixels and a vertical resolution of 4320 pixels, or 4320 resolution video. By comparison, 4K video has half the number of horizontal lines and half the number of vertical lines (3840 x 2160), for a resolution of 2160. Full HD is 1920 x 1080, or 1080. All this means 8K has four times as many pixels as 4K, and 16 times the number as Full HD. 8K video developments to date have largely been driven by filmmakers and TV broadcasters. From a video-editing point of view, the higher resolution can be useful. While filmmakers may not ultimately deliver an 8K film, shooting in the higher resolution gives editors room to manoeuvre, allowing for cropping and zooming while still retaining a high-resolution image. That said, 6K cameras are currently far more prevalent in Hollywood. Meanwhile in Japan, broadcasters have been experimenting with 8K TV for some time. Back in 2015 the Japanese Broadcasting Corporation, NHK, ran a series of 8K trials, and in 2016 the company announced it was successfully demoing 8K broadcasts. So successful were the trials, NHK has now launched the world's first 8K television channel. Since 1st December, it has broadcast 8K shows on a daily basis, 12 hours a day. The Korean Broadcasting Corporation (KBS) is also researching 8K broadcasts, working with LG on content, possible broadcasts and displays – there was 8K experimentation at the 2018 PyeongChang Winter Olympics. And if you were in Brazil during the summer, you could have watched the 2018 World Cup in 8K. So if we can see the fledgling shoots of 8K content, what about the compatible devices on which to play 8K video? Trade shows such as CES and IFA are the perfect place for TV manufacturers to showcase their latest and often craziest new tech, so it's perhaps no surprise we've been seeing the odd 8K screen for a few years now. LG and Samsung both showed off 8K TV prototypes at CES 2015, and Sharp went a step further by offering an 85in 8K TV for sale in Japan later that year (it's now onto its 2nd-gen 8K models). Perhaps in search of some headlines, LG claimed the world's first production 8K TV in 2016. But that's for the Asian market. Indeed, customers in Europe have had to wait. But the wait's over. The gloves came off at IFA 2018. Not only did the likes of LG, Toshiba and TCL all display working 8K screens on their showfloors, Samsung actually showed off its first, now-available 8K TVs (in 65in, 75in, 82in and 85in variants) – we've just reviewed the QE85Q900R and QE65Q900R from that very range. Our verdict in a nutshell: native 8K looks superb on the Samsungs. They're accomplished upscalers too, but due to a markedly paler colour palette and lack of vibrancy compared to Samsung's top 4K TV range, and of course the lack of 8K content available, they're aren't the most logical TV buy right now. As expected, CES 2019 introduced some competition from Samsung's rivals. LG and Sony debuted 8K sets for 2019 launch dates. LG announced the 88in Z9 8K OLED TV (no doubt the fully-realised and now named version of the 88in 8K prototype we saw last year) as well as a 75in 8K LCD TV. The Sony ZG9 LCD 8K TV, which will be available in 85in and 98in versions, uses Sony’s existing X1 Ultimate processor but adds a feature called 8K X-Reality Pro that ‘up-converts’ any content to 8K resolution. As for other TV brands, TCL also unveiled its flagship X10 8K Quantum Dot TV, which is set to arrive in selected markets in the second half of 2019. Naturally, we look forward to getting our eyes on the competing sets later this year - hopefully with some consumer-ready 8K content too! TVs are likely to be followed up with 8K Blu-ray players, games consoles and the like. The first (and only) non-TV 8K product we've seen so far is Sharp's 8K soundbar, which was displayed on the brand's 8K-centric stand at IFA 2018. While we don't know much about the soundbar, we can only presume its HDMI ports are HDMI 2.1-certified enabling them to pass-through 8K content, no doubt ready for those 8K broadcasts in Japan. The soundbar was also billed as offering Dolby Atmos and supporting 22.2-channel surround sound. NHK (the Japanese broadcaster) is advocating 22.2-channel sound as the sonic standard to accompany its 8K 'Super Hi-Vision' video. When will we be watching 8K? While we're always interested in the latest technology, and of course it pays to keep abreast of the latest developments, we don't think 8K TV should be something affecting your buying decision now – or in the near future, for that matter. After all, unless you have access to both an 8K TV and NHK's 8K broadcasts (which is nobody outside Japan), it seems a bit pointless. Naturally, Samsung argues that its 8K TVs' AI upscaling makes the most of 4K (and even Full HD and SD) content, but while we find it 'very good indeed... miraculous when you consider how much of on-screen picture is being ‘made up’ by the TV', it doesn't really offer a significant step forward over the company's cheaper flagship 4K set. Then, as we learned from the early days of 4K, there are the rules and regulations that could see early adopters lose out with an early-wave 8K TV that doesn't support some future hardware necessity. Fortunately, though, HDMI 2.1 – a necessity for connecting TVs to sources for 8K playback over HDMI – should be part and parcel of 2019's 8K sets, and is coming to this year's Samsung's via an upgrade. Also, adoption takes time. Even though 4K TV uptake has, by all accounts, happened faster than that of HD, it still remains the exception rather than the norm. Shop floors may be full of 4K screens, but the vast majority of content is viewed by consumers in HD at best – and even the BBC has only lately dipped its toe in the 4K water. Thanks in part to the football World Cup, 2018 could be seen as a breakthrough year for 4K broadcasts – some five years after the first 4K TVs went on sale. While still a way from permanent 8K broadcast fixtures, we now know that they're doable, both in a live and on-demand workflow. And that they work. Needless to say, this puts 8K at the back of a pretty long queue of upgraders, no matter what broadcasters and manufacturers might desire. In Korea and Japan, however, they're not wasting any time. The 2020 Tokyo Olympics is the aggressive target for showcasing 8K TV in Japan, even if the 2018 Winter Olympics came around a little too soon. We'll be interested to see how the NHK's broadcast 8K channels pan out. But there are plenty of hurdles: content needs to be created, distribution infrastructure needs to be devised, equipment on which to watch it made vaguely affordable. There's also the not inconsiderable issue of storage – 4K is already a serious space-hogger for bang-up-to-date technology.